Following Strikeforce’s memorable “Henderson vs. Babalu” card last night in St. Louis, the promotion has confirmed several bouts for its upcoming, January 7th Challengers event in Nashville, Tennessee. During last night’s Showtime broadcast, it was announced that a bout between rising welterweight Tyron Woodley (pictured) and the veteran Tarec Saffiedine would headline the first Challengers event of 2011. Woodley (7-0) is coming off an impressive KO of Andre Galvao in October, after the accomplished wrestler earned a split decision win over Nathan Coy in May. Saffiedine (10-2) last competed in September and scored a unanimous decision win over UFC vet Brock Larson, while competing under the Shark Fights banner. Prior to that, the noted striker knocked out Nate Moore at a Challengers event in May. As reported previously by FCF, in another bout featuring a decorated wrestler, turned MMA prospect, heavyweight Daniel Cormier (6-0) will take on International Fight League vet Devin Cole (18-8-1). Cormier last competed on November 5th, on an Xtreme MMA card in Australia, and tapped out Soa Palelei in the first round with strikes. Cole is coming off a unanimous decision loss to Aaron Rosa at Shark Fights 13 in September. 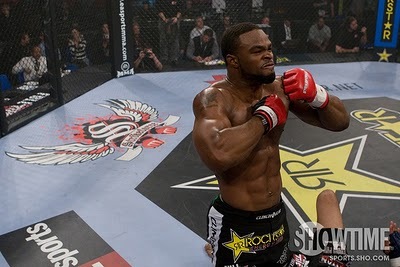 In August, he stopped Trevor Smith in the first round with strikes, while competing for Rumble on the Ridge. Other bouts that have been confirmed for the January 7th Challengers card include; Yancy “Frisson’’ Medeiros (9-0) vs. middleweight John Salter (5-2), Julia “The Jewel’’ Budd (1-0) vs. Amanda “Lioness Of The Ring’’ Nunes (5-1) at 145 pounds, and Nate Moore (6-2) vs. welterweight Nate “Soulforce’’ Coy (8-3). The card will be broadcast live on Showtime.